New Delhi, Nov 8 : A random call with a wailing sound from a child asking for help, gets abruptly cut. And when you call back, you get the trailer of forthcoming Hindi film "Pihu". 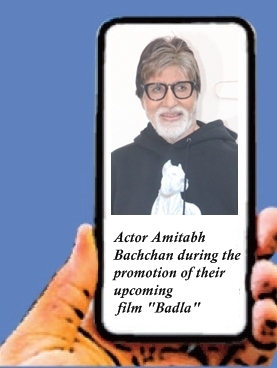 While this marketing strategy did not go well with a section of people, director Vinod Kapri says the intention was only to draw attention to a movie which is offbeat and sans "stars". Towards the end of last month, a couple of people took to social media to share details of the call, slamming it as "a horrible idea, inhuman and desperate promotion strategy", "totally disgusting", "traumatising" and "disgusting". Kapri told IANS: "There are many people who didn't like that, but when you do such films -- offbeat, out-of-the-box, unique kind of films, and when you don't have a superstar, when you don't have a big director, sometimes we try to get attention. Many people didn't like the idea, but there are many people who told us that after that particular phone call, they got to know about 'Pihu' and they will watch the film." The "Miss Tanakpur Haazir Ho" director has himself worked extensively in the media industry. "We know how to pick stories and which part of story we should pick, so my media friends pick the negative side of stories. There are many people who wrote on Twitter that they got to know about the film from that phone... So, for some people it works, for some people it doesn't work. But the intention was to get people to know about the film." "Pihu" is a movie which has a single protagonist Pihu, a two-year-old girl. A social thriller, it traces how Pihu grapples when left alone by her parents. The movie had opened the International Film Festival of India (IFFI), Goa, last year, and had elicited a positive response with its edge-of-the-seat drama. Kapri described it as a "completely family film".